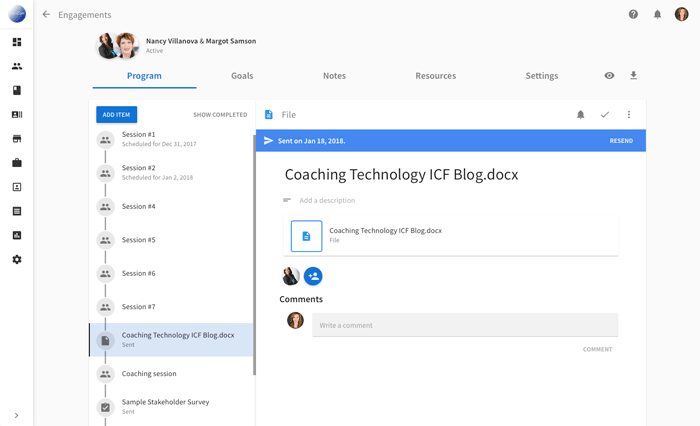 Learn more about all the features CoachLogix offers to help you manage your coaching practice in one place. Programs can be found inside engagements between coaches and coachees. A program can be made up of sessions, forms, tasks, and files. You can add items to programs as you go along or save time be creating program templates. While an engagement is in a draft state only the admin creating the engagement can see it. If the admin chooses to share control of the engagement with the coach, then the coach can also see the draft state before it is activated. Admins and coaches will be able to see Program, Goals, Notes, Resources and Settings tabs whereas Coachees, if invited, cannot see the Settings tab. Only Admins and Engagement Managers can edit the Program and Settings areas. Engagement Managers and Viewers can be added under the Settings tab. Coachees can only see sessions where they are an attendee and program items where they are a recipient. You can add external people by email as session attendees, recipients of forms, and as stakeholders on goals. 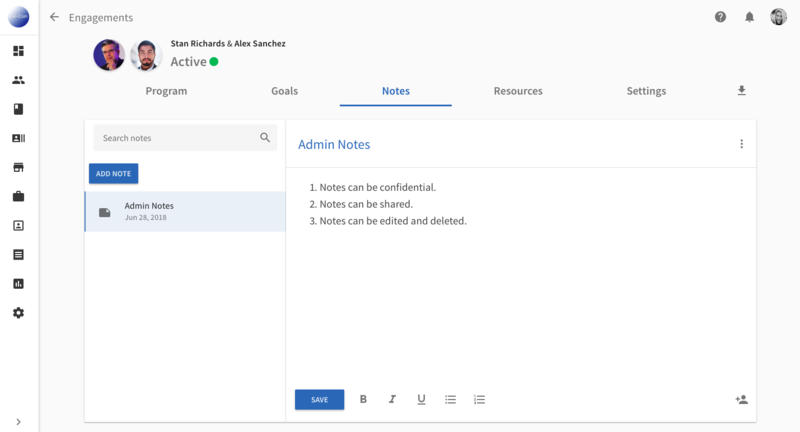 If individuals are added by email they can receive notifications related to sessions, forms, and goals that they've been added to and can fill out forms and provide feedback on goals from their email. 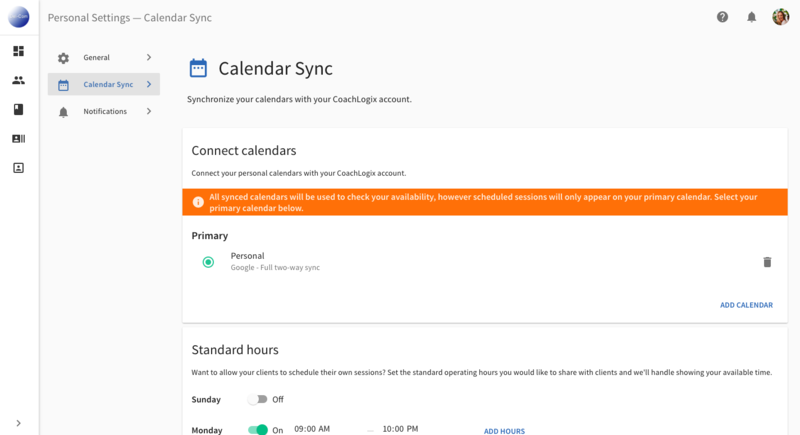 Coaches can sync their personal or business calendars with CoachLogix under their Personal Settings. Once a calendar is synced, events that are scheduled in CoachLogix will also appear in your synced calendar. Calendars that can be synced include iCloud, Google, Office 360, Exchange and Outlook. Coaches must set their Standard Hours if they want coachees to be able to schedule sessions during their available time slots. If a coach does not set standard hours, the coachee will not be able to schedule sessions. Only admins and the coach can schedule sessions if the coach's calendar is not synced. If you plan to use CoachLogix for record keeping rather than scheduling, simply click the check mark to indicate when a session has been completed and enter the session time and date. When a coachee wants to schedule a session Automatic Time Zone Adjustments will be made to set the time to that of the viewer's time zone. Sessions can be Scheduled and Rescheduled by admins, engagement managers, coaches, and coachees. If a coachee decides to cancel a scheduled session that is outside of the coach's late cancellation policy the charge will appear as billable activity on new invoices. Forms are online surveys that coaches can send to coachees and other optional recipients by email. Forms can be used to gather information from users and can be sent directly from the program. You can create confidential forms, which only your account admins can view results from. Files can be uploaded directly to the program or can be shared via the engagement Resources tab. From the program, documents can be sent to anyone by email. Files under the Resources tab are visible to all engagement participants. Files uploaded under engagement settings are only visible to admins, engagement managers and coaches. 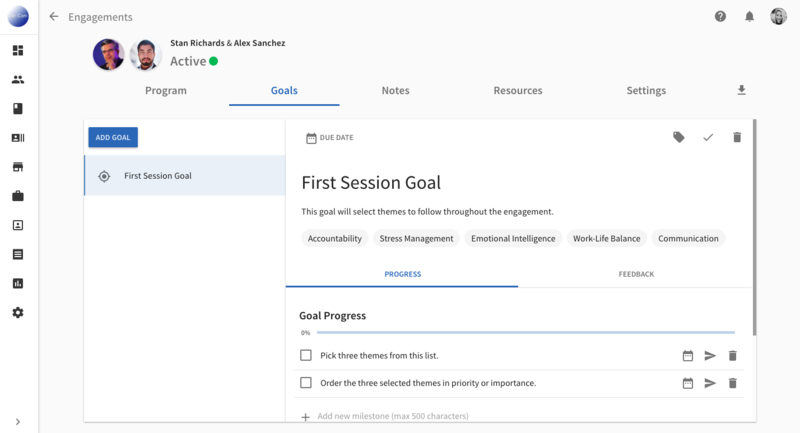 Admins, Engagement Managers, Coaches and Coachees can add goals and milestones. Admins, managers and coaches can optionally tag goals with themes to track theme progress. Theme libraries must be assigned to engagements (under Settings) for this option to be available. Under the goal Feedback tab, Admins, Engagement Managers, Coaches can add stakeholders and send requests for goal feedback. 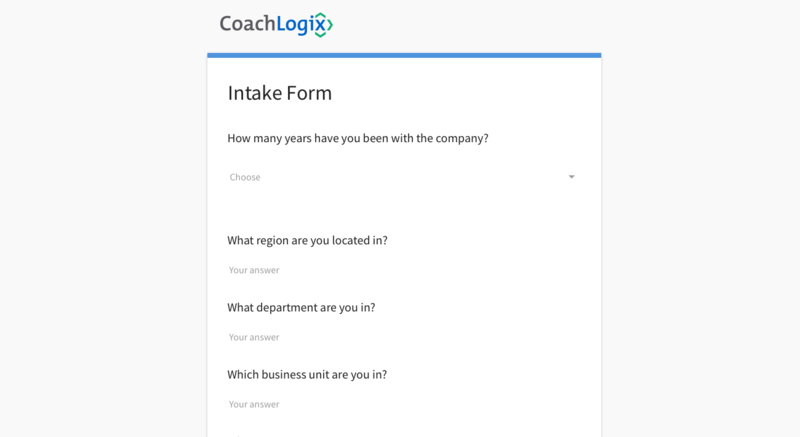 Stakeholders can fill out feedback forms from their email and responses will be collected in CoachLogix. 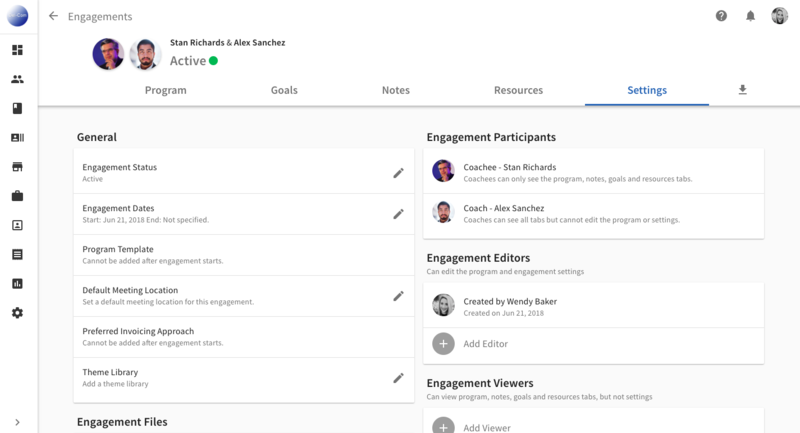 Everyone with access to the engagement can view shared goals and stakeholder feedback. 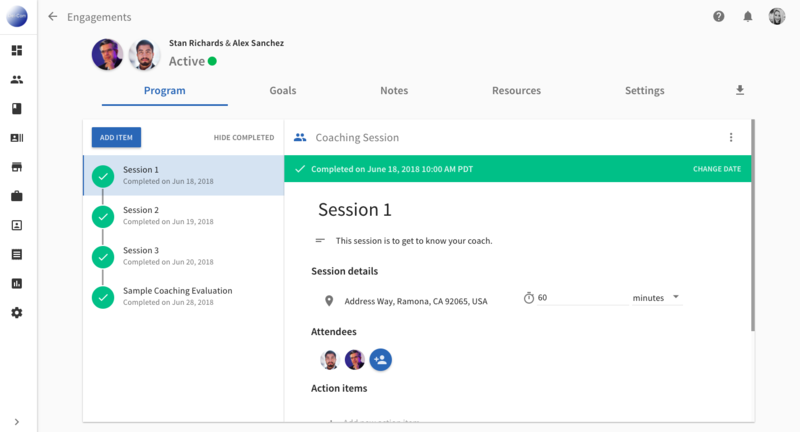 When goals are created, Coaches and Coachees have the option to create private goals which are not visible to Admins, Engagement Manager nor Viewers. Coaches can create session notes from the session "more options menu" or create notes anytime under the Notes tab. Notes are private unless the creator chooses to share them with others. You can optionally share notes by clicking the "share" icon. The share icon will appear in the upper right corner after you save the note. Anyone with access to the engagement can create and share notes. Shared notes are read-only. The person(s) you share with cannot edit the note. Invoices can be created ad-hoc under your account Invoices tab. CoachLogix keeps track of all billable sessions, and expenses can be added at any point in time. 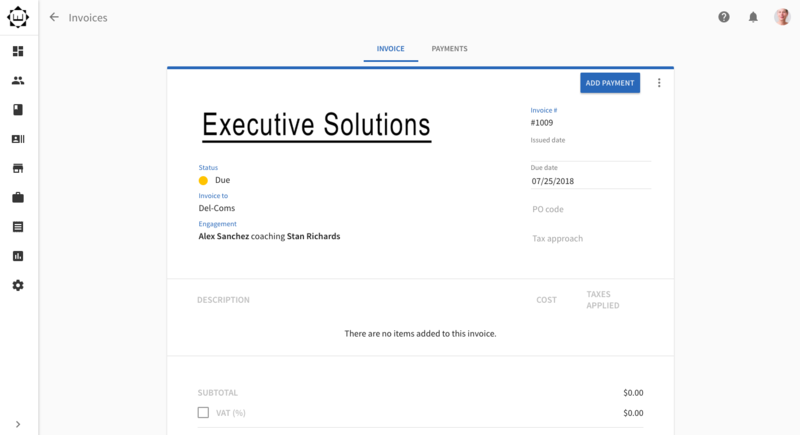 Send invoices to privately contracted clients, client companies and coaching vendors. If payments are made via our Stripe payment integration, invoices will automatically be marked as paid. Link Stripe to your CoachLogix account to collect payments from privately contracted coachees and to make/approve payments to independent coaches. After setting up Stripe under your account settings you will have the option to collect payments via Stripe each time you send an invoice to a privately contracted coachee or coaching vendor.